We had a fun time at Kai’s Birthday party. 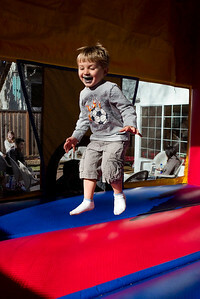 They had a bounce house in the backyard where the kids rarely took a break from jumping around. Kai was jumping along with many of the other kids. 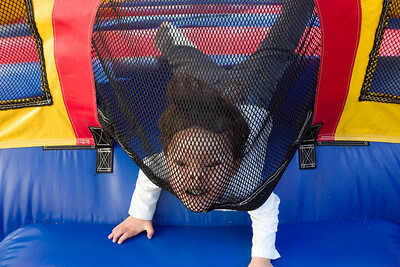 Claire had a very hard time walking around the jump house with all the kids tossing her around. 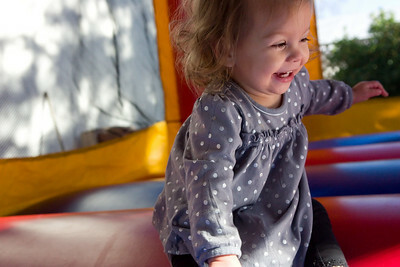 She had a moment alone in the jump house and was able to enjoy it a little more. Matthew found a use for the jump house screen that I hadn’t yet seen. Of course, I don’t spend much time around jump houses, but this looked awfully strange to me. Matthew gave Kai his first John Deere die cast tractor. Now they have matching tractors.